This symbiote can bring pain or heal disease. And all of that power is under Eddie Brock's control. Build your own winged Hobgoblin figure with the parts that come with these cool Marvel Legends Infinite Series figures! 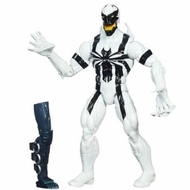 This Anti-Venom figure has the symbiotic powers to outwit his villainous foe, and he also comes with a right leg part for you to build a Hobgoblin figure! Collect all 6 parts (other figures sold separately) to complete the criminal mastermind's body, then let him and your Anti-Venom figure duke it out! The action is epic when you build your own Hobgoblin figure! Marvel products are produced by Hasbro under license from Marvel Characters B.V.